It’s been more than 90 years since the birth of the SAT, and a whole lot has changed since then, both on the test and in the world. 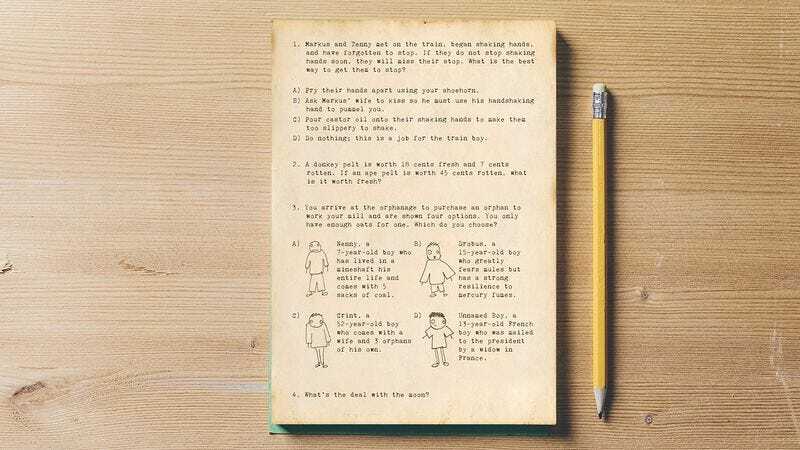 These incredible questions from that original test offer a fascinating glimpse of what high school students were expected to know to get into college back in that long-gone era. Wow, it’s easy to forget that just 90 years ago cars were still a relatively new technology and trains were still king. Incredible! Look at those prices. 45 cents for a rotten ape pelt?! Sounds like 1926 was a great time to be alive. Yikes! Can you believe 18-year-old kids were expected to know all this stuff back then? This is the only question that still appears on the SAT, but the fishwife now has a lot fewer fish. What an amazing window into what we used to think the SAT needed to test. The times have really changed.